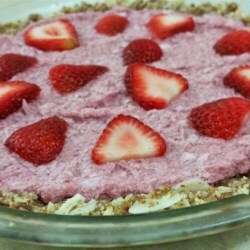 "A super easy, raw, vegan strawberry pie! It's absolutely delicious. Feel free to add blueberries also." Place almonds, 1 cup coconut, dates, 2 tablespoons coconut oil, and salt in a blender. Puree until ingredients form a dough. Press dough into a pie pan to form the crust. Place 2 cups strawberries, 2 cups coconut, 2 tablespoons coconut oil, and salt in a blender. Puree into a cream. Pour cream over the crust. Top with sliced strawberries. Refrigerate until cream is thickened, about 2 hours.